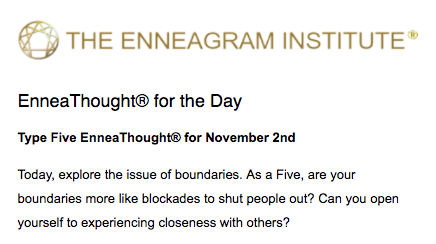 Does the daily Enneagram email open the library and read you too everyday, or is it just me? They always just seem a little too sharp and timely. And it’s especially ironic that this was the email today, after what happened to me yesterday. If you haven’t been keeping up with me on social media lately, I’m currently in yoga teacher training and I graduate next week (announcements about classes and offerings coming soon!). It’s an experience that has stretched me physically, emotionally, spiritually, and mentally in the best possible ways. It has deepened both my practice and my understanding of it, as well as my commitment to seeking and providing holistic ways to process our pain and our trauma creatively in ways that honor ourselves and each other. In short, yoga has kinda changed my life a little bit, and yoga teacher training has been a major part of that transformation. 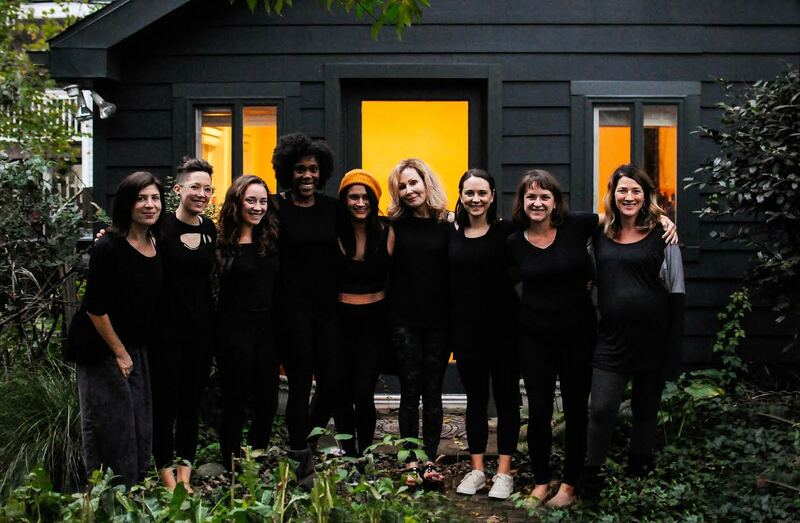 One way I didn’t expect yoga teacher training to stretch me, however, is relationally. I don’t do well with strangers or new people—it’s why I always recycled boyfriends when I was single because that was easier than learning someone all over again. I really have to psych myself up to prepare to bring a new person into my inner circle, and it usually takes months to years. Anybody who has tried to get to know me or is currently in the process of it knows how tentative I am, how ardently I strive to be kind even as the process drains the energy out of me like I’m giving blood. My whole life I’ve been an introvert-in-denial. Even when I’m performing, standing in front of dozens or hundreds of strangers sharing supposedly intimate details about my life, I’m following a script. I decided beforehand what I would share and what I would not. I have a mental rolodex of facts I’m okay with divulging. People come up to me afterwards and thank me for being so vulnerable and I laugh silently to myself. I want to tell them that I’m not actually vulnerable. I just have a higher threshold of what constitutes vulnerability than most people. They say you can’t choose your family but you can choose your friends, but yoga teacher training is more akin to the former. You don’t get to choose who you end up with, you’re just all in a room together for four hours a night two nights a week for four months because you all signed up and paid the fee, and it could be great or it could be terrible and there’s literally no telling when you arrive the first day. These people could be anybody. They could be Trump voters for crying out loud. Nevermind that the teachings of yoga stand in diametrical opposition to everything about Trump! That won’t stop some people! This was my internal monologue the first night of class. Except that every single one of these women turned out to be incredible, inspiring, jaw-droppingly awesome in completely different ways. Hannah might be the best teacher out of all of us and has such a disarming sense of humor you can’t help but like her. Ashley moves through the world assuming the best of everyone and does things like quit her corporate job to become a yoga teacher just to show that it can be done. Murphy has a lifetime of experiences under her belt but her heart is so youthful, and her charming self-deprecation often leaves us in tears from laughing so hard. Emily is brilliant: her brain is like a steel trap for Sanskrit, and she remembers things the rest of us have probably already forgotten. Liz is a fellow female entrepreneur and a master of aesthetics, so intuitive about how to present things to others in a way that is beautiful and compelling. And Coco is thoughtful: she pays attention to the people she cares about in a way that makes you feel truly seen. Which is where this story is going. Because somewhere along the line, I let down my guard. What I love about yoga teacher training and also yoga in general is that when you get on the mat, you check everything else about you at the door. Outside you may be someone or many someones to many different people. But on the mat you are just you. Maybe that’s why I found it easier to be “just me” with this group of women. But whatever the reason, as the weeks wore on, I slowly started to find myself divulging the things that actually cost me. Not the rehearsed things I’d said in front of strangers at a show a dozen times, but the things that caught in my throat on the way out. What’s more, my anxiety about it began to fade. I wasn’t worried no one would like me if I said this or that, and I learned to stop playing everything back to myself later wondering if I had said something wrong. I made baked goods. I responded to text messages. I hung out outside of class. I reciprocated the occasional hug. Basically, I loved and let myself be loved. About a month into the program, I had said something to the effect of, “I really like you guys but I feel like I need to tell you that with words because my behavior doesn’t always communicate it because I am a prickly barnacle.” (Hey, at least I am aware of my dysfunctions.) And she remembered. Probably my husband and closest friends will read this blog and be like DUH EMILY THAT’S WHAT HAPPENS WHEN YOU LET DOWN YOUR GUARD AND BE VULNERABLE AND LET PEOPLE LOVE YOU COUGH COUGH which yes, you guys are right and I am wrong, there. Savor that. But for the rest of you I guess what I’m trying to say is that the world is not entirely a nightmare, and that I’m learning that you can actually be loved better when you let people know you better. I would have appreciated a “POET” mug. My poetry is a huge and important part of my life. But it’s also something you can find out about me by Googling my name. And it is the unGoogleable parts of us that need love the most. 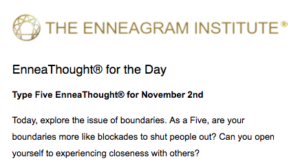 As an Enneagram type 5, I start each day with a finite amount of emotional and physical energy, and when it’s gone, it’s gone, and then I have to go to sleep. Ask anybody who has ever invited me to a party just to look around a couple hours later and ask “Where’s Emily?” (Hint: I either left without saying goodbye or I found a room to take a quick nap in. Don’t look for me.) Learning new people and even maintaining existing friendships can be withdrawals from the bank, each interaction taking a few cents off here or a couple dollars there. Some cost me more than others. But what I’m learning is that while there’s no getting around that, there is an opportunity for me to change my attitude towards it. For a lot of my adult life, I’ve been stingy about that energy, hoarding it away for some emotional rainy day that never comes. But it’s actually meant to be spent. And there are actually quite a few people worth spending it on.